You are here: Home / Running / 106 Miles of Groovy! 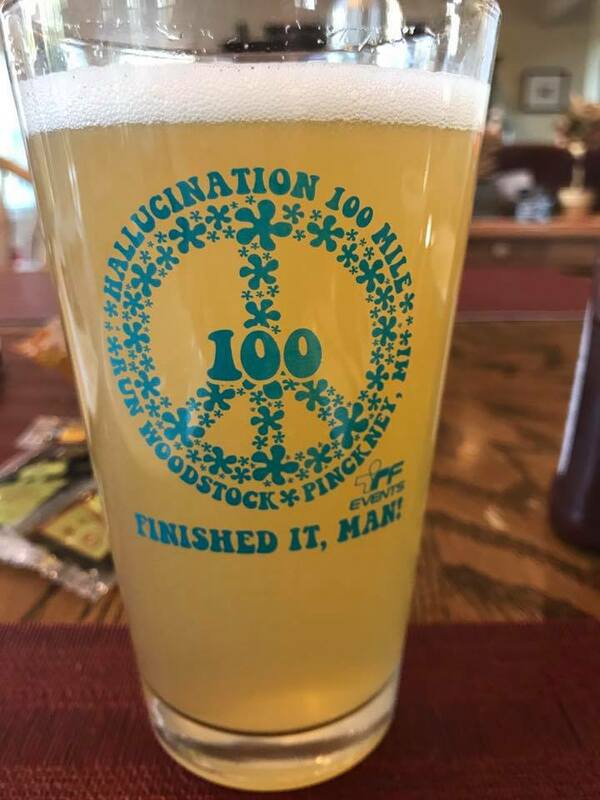 2017 Hallucination 100 Race Report. 106 Miles of Groovy! 2017 Hallucination 100 Race Report. Introductory note: I had some special inspiration for this race. You can read about that here on my pet blog: Blogging Adversity and the Journey From Helplessness to Hope (Winner 2017 Blogpaws Nose to Nose award for best written blog post). 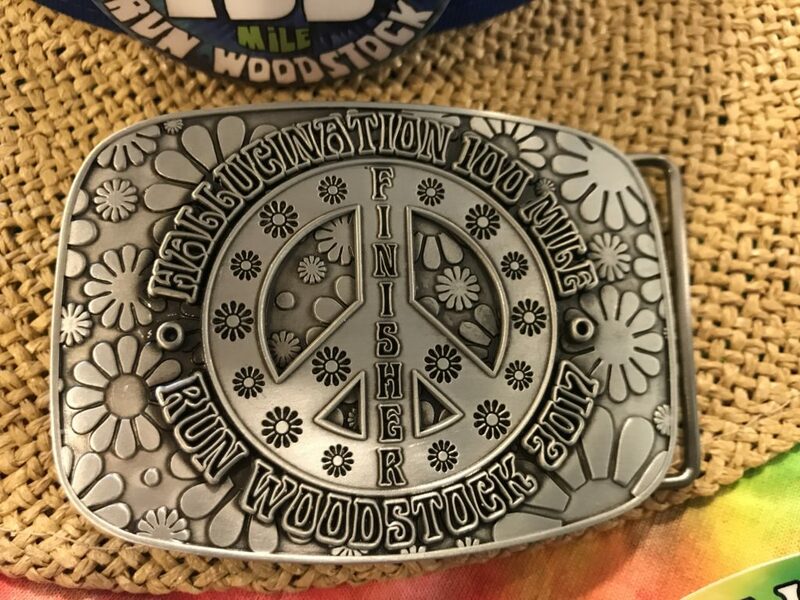 Hallucination 100 at Run Woodstock in Hell, Michigan was my first 100-mile race. It actually turned out to be my first 106 mile race since I managed to get lost, despite a well marked course, on the first loop. Ooops! It also was a good test of my ability to fuel an ultra almost entirely on UCAN (affiliate link) since my stomach didn’t want solid food the entire time. I’ll start out with a bit about the race and the course for those looking for practical information. Then I’ll dive into my personal account. 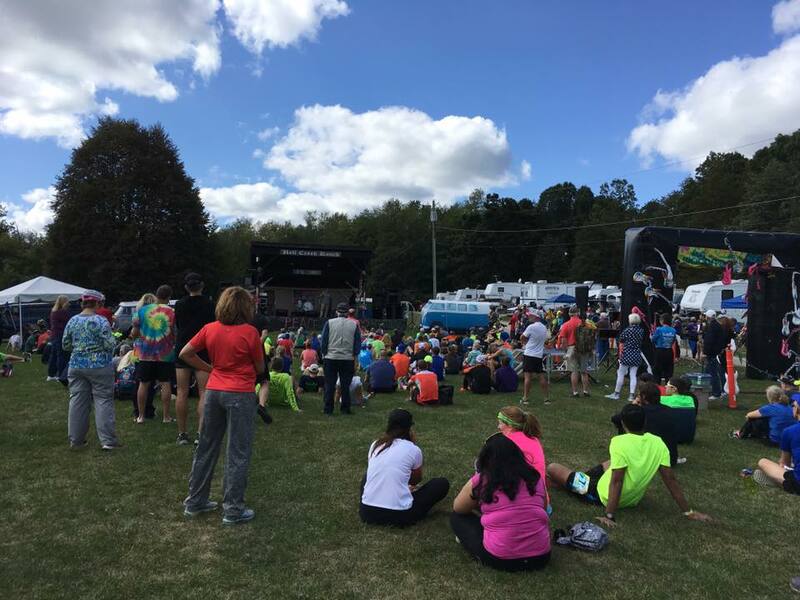 Run Woodstock is a party atmosphere running festival with camping, bands, yoga, tie dye, hiking, and runs of every length: 5 mile, 1/2 marathon, marathon, 50k, 50 , 100k, 100. The 5-mile runs include a “natural option” where people have the option to go to a different course, disrobe, and run naked. More on that in my personal account of the race. 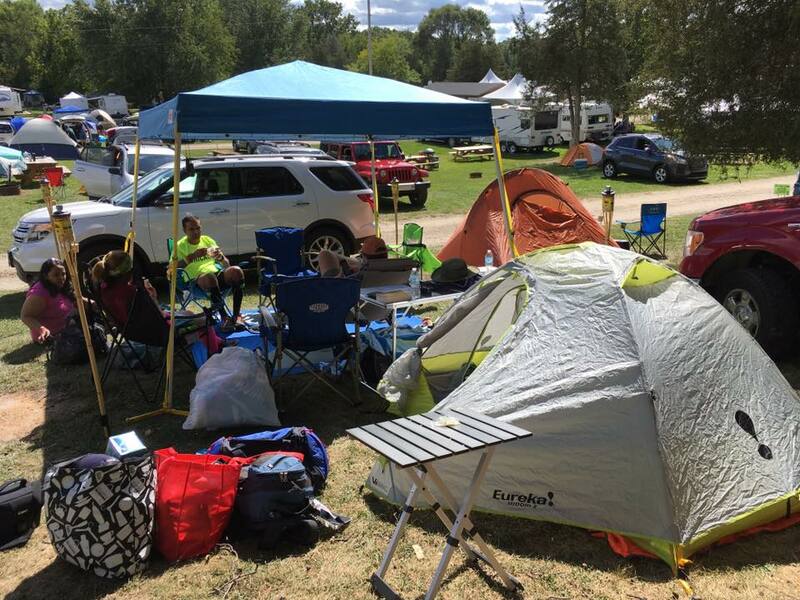 Camping can be reserved with registration either in the form of sites chosen from a map, or first come, first serve walk-in camping on race day. RV sites sell very fast. Most reserved tent sites can fit a car and a few tents. Sites vary in flatness. Ours had an incline, but we got three tents, a canopy, and one car on it even though it was not a huge spot. So if you don’t mind being cozy, you can cram a lot in. You can park cars across the road for easy in and out. Otherwise they prefer that you avoid moving cars much during the races. The festival includes food trucks, and there are places to go eat down the road. Alcohol is permitted. There are hot showers, sinks, and flush toilets for campers in the pool bathhouse. I believe there was also a cold shower truck. The 100-mile, 100k, 50-mile, and 50k course is mostly single track, with a few sections of road. There is a gravel road section of perhaps a mile and a couple of miles of dirt road. There is also a short section of trail more akin to a jeep road, and there are several short sections of boardwalk. With one minor, sort-of exception, the course is well marked. The 100-mile race runs 6 16.6-mile loops. The course is a Western State’s qualifier. Pre-race meeting. It was short and basically said to follow the pink flags. Turns out I wasn’t very good at that! The single track on the first portion of the course is highly runable. It is mostly sandy, but not deep sand. I had no issues running without gaiters. Instead, it is nicely packed down but still soft underfoot. I fell a few times on roots hidden in the sand, and it felt like falling on a sand volleyball court. Some of the single track is loose dirt that feels similarly soft. Supposedly the trail is a mess of mud in the rain. It is a lovely wooded trail with minimal hills and just a few minor ups and downs to keep the muscle use broken up. I like that. 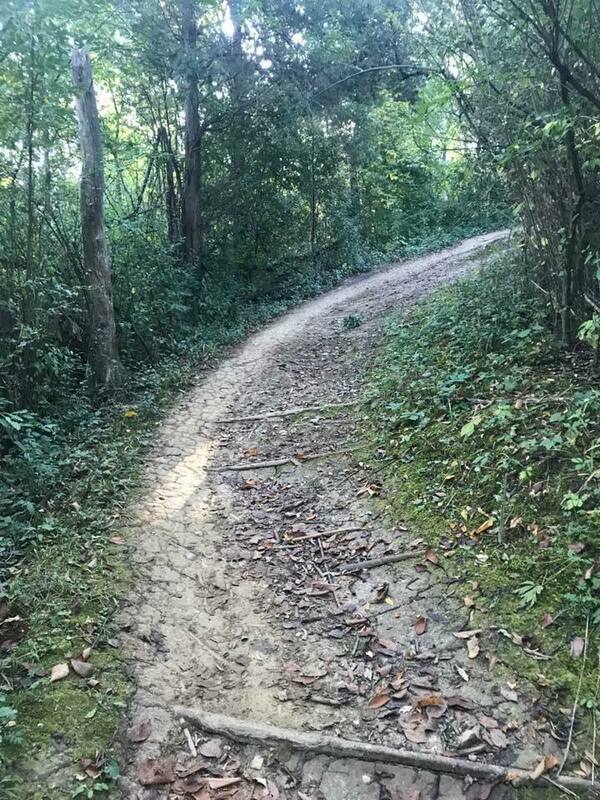 After emerging from the initial single-track section at the Gracie aid station, there is a section of dirt road, then the course ducks back into the woods to the Richie’s Haven aid station. The Richie’s Haven loop is hillier with more roots to watch for. There is one section of trail containing rough black plastic material sunk into the trail, perhaps to control erosion. It is uncomfortable to step on and bit slippery when dry. I can’t image it wet! It also in on a hill. Fortunately the section of it is short. After arriving at Richie’s Haven, there is a bit of gravel road, followed by more rolling single track, mixed with boardwalks. It is in this section that the 100k and 50k runners take a short cut. It is well marked. Runners in the 100-mile and 50-mile races should be very aware that, when they reach the road after this section, they should turn right and head to the Gracie aid station. There will be a small sign by the road with an arrow pointing that direction. Straight across the road are lots of pink markers to go into the woods and there is nothing there to indicate that it would be the wrong way. But it is. That will enter back into the Richie’s Haven loop and is why I accidentally ran that loop twice, adding miles to my race. Ideally the race here would put a prominent sign across the road stating that Richie’s Haven was straight ahead and Gracie’s to the right. I am not the only runner who made that mistake. I met several during the day and also met a person who made the same mistake the year before. After the race, a person online told me that he too was a member of the Hallucination 106 club. After leaving Gracie’s for the second time, the course returns on single track to the start/finish area. This is again quite runable and sandy. This section has one rather large hill that you will be cursing by the last lap, followed by several more fairly significant, albeit short, hills. 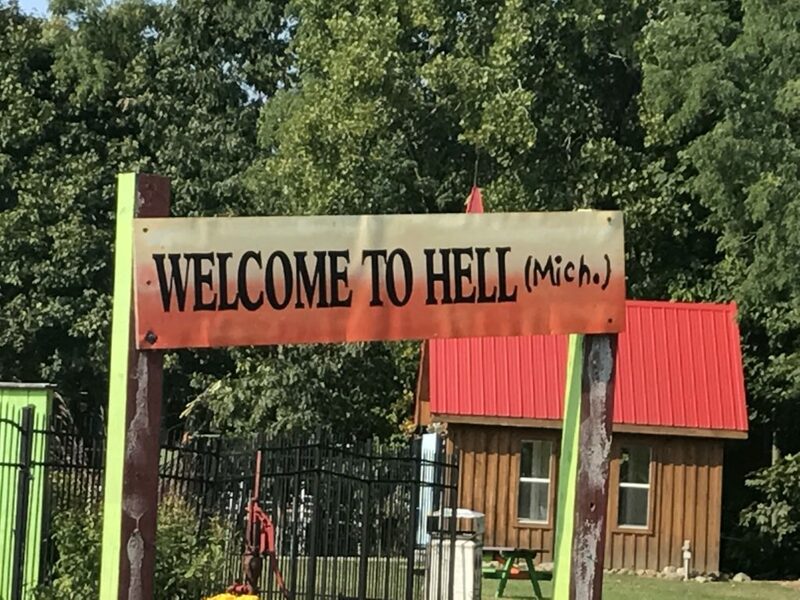 The other evil thing about this section is that it loops past the campground and then returns back, so you can hear the music and see the lights at night for quite a while before you actually get there. When you think you are there, your really have another mile or so to go. The course has aid stations about every four miles. Gracie’s is visited twice. Each station has a good selection of the normal ultra food. Some sort of sandwiches and fruit, candy, chips etc. were always available. However, I noted an absence of ginger ale most of the time. Gatorade is the sports drink used and it was mixed very weak. The start/finish area had the most in terms of hot food, such as grilled cheese, pancakes etc. The Hallucination 100 has a 4pm Friday start and allows pacers after the second loop. When combined with the loop course, that makes the race very friendly in terms of runner assistance. 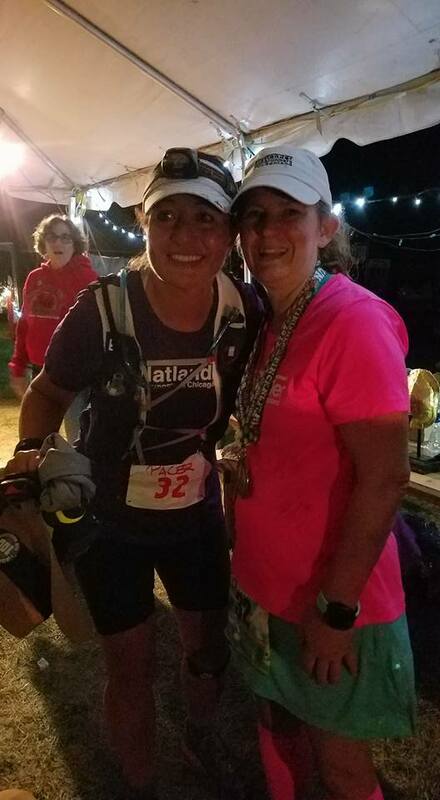 Crew can hang out at camp and enjoy live music, and runners can get the night over early and can have pacers for a significant amount of time. The race gives out a good amount of finisher’s swag. 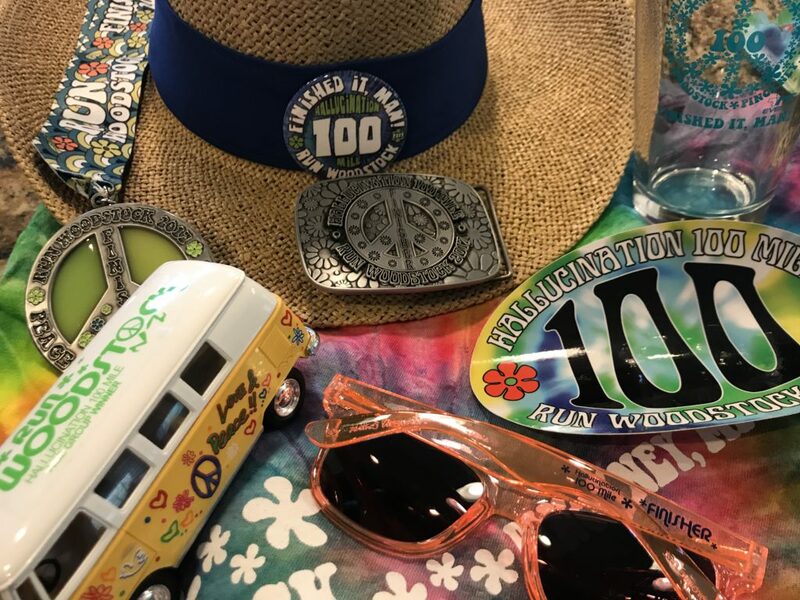 Aside from a generic Run Woodstock shirt and a specific Hallucination 100 hooded T shirt, finishers get a hat with a 100-mile finisher’s pin, a car sticker, finisher’s sunglasses, pint glass, medal and, of course, the all important belt buckle. The race overall is fun and laid back, but also well organized and well run. Great volunteers! Be prepared for a good course and a good time. I would highly recommend this race as a first 100. I started out conservative. My only goal was to finish, and I did not want to go too fast. But then I messed up and ran the Richie’s Haven aid station loop twice. I was with another runner and neither of us noted the turn on the road. The upshot was that about 6 miles got added onto the race. Fortunately, I was already mentally prepared for something weird like that to go wrong and I just took it in stride. 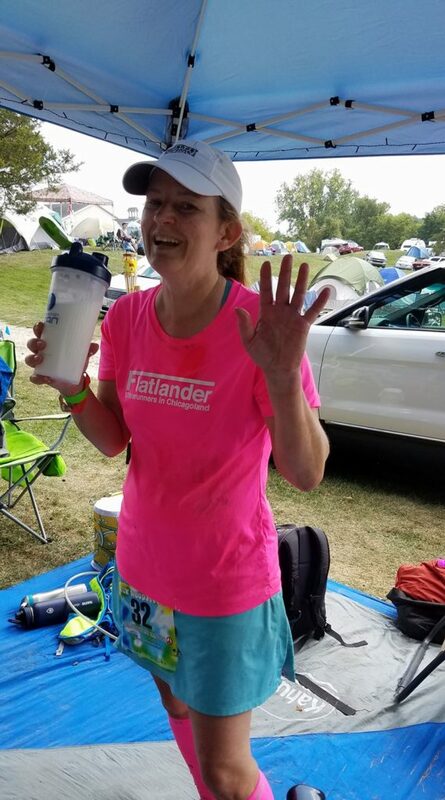 I told the helpful aid station folks that it is supposed to be an adventure, told myself that I was going to pick up the pace a bit to assure that I got my F’ing belt buckle (which became a theme of the race in a fun way), and took off. The whole thing actually fired me up. I also was glad that I had put my mini pen light in my hand held water bottle case, because getting lost meant that it got dark before I got back. I will never run a race without that light with me! This is my pen light. I love it. This is my handheld (affiliate links). The light fits in the zip pocket just fine. 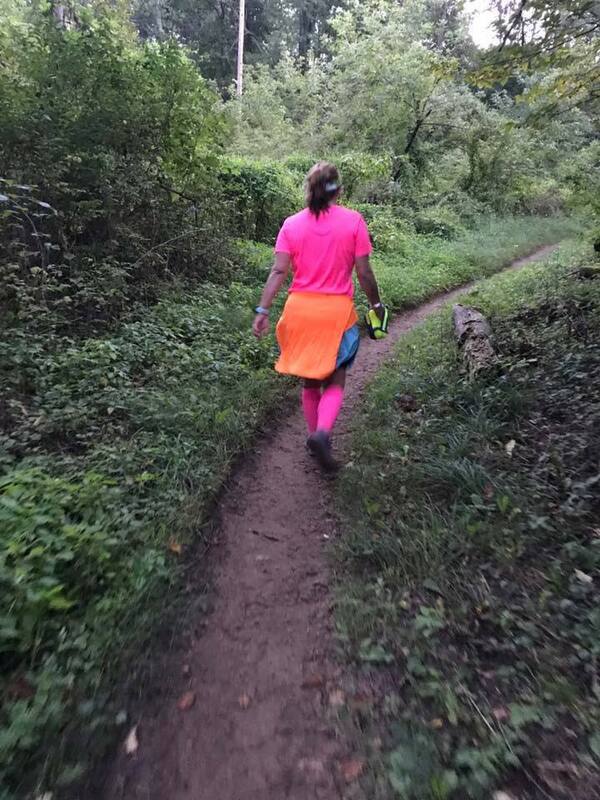 I initially planned to switch back and forth between my running vest and the handheld, but I kept the handheld the whole race since aid stations were so close together and I just didn’t feel like putting the vest on. After my first loop took well over an hour more than planned, I downed some UCAN (affiliate link) and took off. My stomach, which normally is fine, did not want solid food the entire race. I had woken up nauseated, I think from allergies, and so it was good that I brought the UCAN. I fueled the entire race on it, bits of fruit, Coke, and sometimes Gatorade. My second loop was all night and I loved it. Running alone on the single track without seeing many other runners might bother some people, but for me it was completely energizing. It seemed magical. I felt like I could go on forever and the time flew by. One section of the course had a chorus of owls making a lot of noise. Another had coyotes yipping up a storm. I loved hearing them. It got cold overnight (40 degrees) but I staying in my skirt and short sleeve shirt the whole race. After loop 5 at 83 miles. Well, actually 90, since I had already tacked on 6 extra. My pacer Melissa joined me for loops three and four. We enjoyed another loop of darkness and then I got quite a second wind during loop four and finished that loop in under 4 hours. I really recall little of the loops other than Melissa and I having a good time and singing songs in which we (well, mostly me with Melissa laughing) continually inserted the phrase “get a F’ing belt buckle.” Profanity in the form of comic relief became quite a theme as the race went on. Loop five I was on my own and started to get a bit tired, but nothing I couldn’t handle. I just kept moving and was worried about time since I had, after all, added six miles to my race earlier. One interesting event happened just as I was finishing the loop. A runner ahead of me yelled back “look out for the pig!” I looked over and, there in the bushes by the trail, was a black pig all curled up for a nap. It lazily looked up at me. I pondered whether Michigan had wild pigs, and made sure I told everyone that I saw it and that it was not a hallucination. 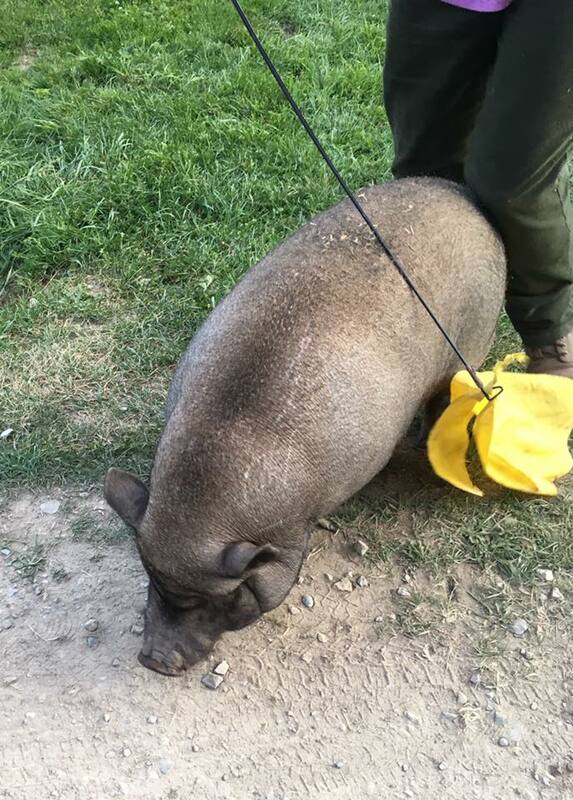 Turns out it was a pet potbellied pig from the nearby ranch. Its owner later came and rounded it up. My Mother got a photo of it. My last loop, Linda joined me to pace. I told her to tell me if I fell under a 20 minute pace, and I generally kept in the 15 range doing a run/walk for the first half of the loop. Once we hit half way and I learned that I had something like 5 hours to go 8 miles, I said screw it and decided to walk. From there a lot of singing F’ing belt buckle songs ensued. I think the Richie’s Haven aid station people thought we were nuts as were were singing (if you could call it that) quite loudly as we rambled in there. The final 4 miles were the most interesting. It got dark and, just when I was complaining that I wan’t going to hallucinate when I really wanted to experience that, I saw an ape hiding behind a tree. I burst out laughing and scared Linda! From there, I hallucinated constantly for several miles. I saw plastic toys in trees, giant plastic Pokemon in the woods, little toy dolls in cars at the side of the trail waving at me (I waved back and told Linda to wave too), a mini crocodile on the trail, people with party lights, tents, and more. I got a pretty big kick out of it all. Sometime during all of this, my friend Siva came tearing through singing Bollywood songs and gave Linda and I hugs. He finished maybe half an hour ahead of me. When we were about a mile from the finish, the naked people started to come by. They were not hallucinations! People were returning from the natural option five mile That race is in its own area, but some chose to return to camp without getting fully dressed. Soon a buck naked guy ran by stating that he was sorry but someone took his clothes. Linda, turned around to warn him not to bump into me and lit him up full frontal with her head lamp. I lit up his behind as he went by. We later saw him wrapping a shirt or bandanna around himself like a loin cloth. Needless to say, it was a fun distraction (for us at least) that helped make the last mile go by quicker! The finish was awesome. Not simply because it was the finish and was my first 100 miler, but because there were a bunch of people lined up on each side holding their hands out for high fives. It was very celebratory. Linda come over and hugged me and cried, which made me cry. I was a bit delirious and surprised to get a neat bus as an age group award. 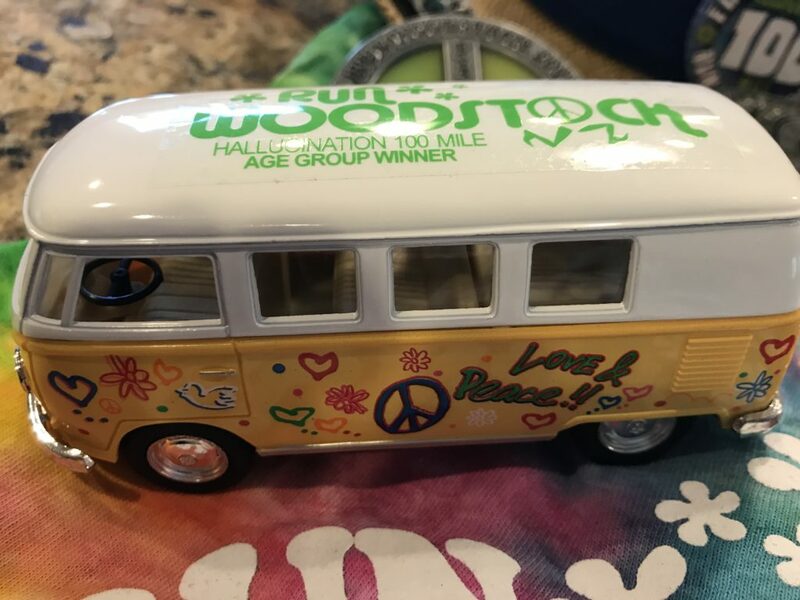 There were only four in my age group, so it wasn’t some sort of huge feat, but the bus is super cute. I was freezing once I sat down, but got under a sleeping bag while the car got packed up. A pretty good band was playing, which was neat too. After the race, I was quite sore and, oddly, my big toes were somewhat numb. But the soreness wore off fairly quickly. But my toes still are numb weeks later. I saw the doctor who is not at all concerned. According to him, if a nerve gets angry, it holds a grudge for up to ten weeks. I have been running just fine with numb toes. Overall the whole thing was amazing. I can’t wait to do it again! Big thanks to my husband Ken, Linda’s husband Mike, and my Mom for spectating and crewing. Heather was my phone a friend during loop 5. And super big thanks to Melissa and Linda, whose company was extraordinary. They each drove out to Michigan from Chicago and sacrificed a crazy amount of time and sleep to help me. They are my heroes! Super heroes!!! Oh yeah, I almost forgot a photo of the F’ing belt buckle! Next up: Rocky Raccoon 100 in February followed by the summer of mountains (Broken Arrow Sky Race, Never Summer 100k, and Grand Canyon R2R2R). I put in my first ticket for Western States, which would replace Broken Arrow if selected, but, given that the odds on the first ticket are around 2% I’m not holding my breath. I actually would prefer to not get drawn for 2018 and get drawn in another year or two, but I’m not wasting a ticket!